Meanwhile, surrounding these two people are a high “S” friend and a high “I” relative. The “I” suggests a dinner or night out and the “S” asks what are some of the things the two of them can share in…and would they be willing to do this? Would they be willing to do the weekly groceries together? 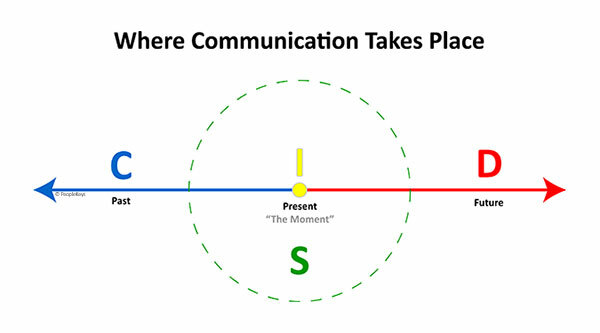 Graphical illustration of "Where Communication Takes Place"
This is a great training tool you can use to help understand certain “blind spots” in communication. First, I must say that two people have to agree they want to try. If someone is not open to trying, then it is really a Values principle more than a DISC communication problem. However, we can show the pitfalls and traps into the type of communication taking place here. In this example, the high “C” woman is communicating totally from past circumstances. You can see that in the chart and from her words. The high “D” man wants to forget the past and focus only on the future, according to the illustration and his words. As long as they both only see these viewpoints, things will not change. Meanwhile, the “I” is right in the present moment “Hey, let’s go grab some dinner together” and the “S” is not too far in the past, nor too far in the future, and suggesting things they can share and do together. This works for just about any situation. As you look at this graphic, think about relationships. “I” styles together immediately “hit it off” and start a party (if they can). They like “being in the moment” and adapt very quickly to the people around them and what is happening. They are great that way, but don’t always think about the future or the past unless they are consciously aware they need to. “S” styles do not like to talk about problems too far in the past, as they like peace. They like to know what is going on around them and happening at work, but they don’t necessarily want to talk about the company 5 years out like a “D” style may want to speculate about. Another example, being a “D” style myself, I always tell people at work, “Don’t come to me telling me only the problem. Tell me a solution (or at least try to think of something so we can talk about a solution rather than a problem)! You see a problem is in the past and a solution is in the future -- a place where I feel more comfortable as a “D”. If you use this simple graphic, you will save years of learning how to communicate with other styles. If you're not sure of your DISC behaviroal style, take the DISC personality style report here, or check out our certification courses in behavioral analysis to gain an even more in-depth understanding of others' behavior when it comes to the way they communicate. Please, write us and tell us your own story about where communication takes place.